1686 Dapper Map of North Africa : Morocco, Algeria, Tunisia, Libya ADDITIONAL IMAGES AVAILABLE ON REQUEST WE SELL ONLY ORIGINAL ANTIQUE MAPS - NOT REPRODUCTIONS. Title: Barbaria Biledulgerid o: Libye et pars Nigritarum Terra. 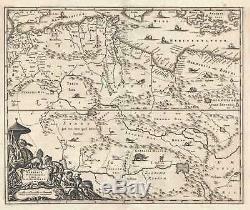 Description: This is a 1686 Olfert Dapper map of North Africa. The map depicts the retion from the Strait of Gibraltar to Libya and Crete and from southern Spain, Sicily, and the Mediterranean Sea to the Niger River. Highly detailed, myriad locations, particularly along the African coast of the Mediterranean Sea, are labeled, such as Tangiers, Algiers, and Tripoli along with Gibraltar, Sevilla, and Grenada in Spain and Syracuse in Sicily. Numerous rivers and lakes are illustrated and labeled throughout northern Africa, along with several unlabeled mountain ranges. Beautifully engraved boats are included in the Mediterranean, as well as several different species of animals in Africa. Some of these appear to be lions, along with an ostrich, and elephant, and other big cats. A decorative title cartouche is situated in the lower left corner. This map was produced by Olfert Dapper and published by in the French edition of Description of Africa entitled Description de L'Afrique and published in 1686. Size: Printed area measures 10.5 inches high by 13 inches wide. If your address is a P. We can use your Federal Express Account. Duty varies by country and we cannot predict the amount you will be charged. Some countries are duty free, others are not. Other Services Conservation Framing: Geographicus recommends basic conservation framing services for any antique paper. We do not offer this service. Antique Map Restoration: Geographicus can repair and restore your antique map. Services include deacidification cleaning flattening and backing. The item "1686 Dapper Map of North Africa Morocco, Algeria, Tunisia, Libya" is in sale since Friday, January 4, 2019. This item is in the category "Antiques\Maps, Atlases & Globes\Africa Maps". The seller is "geographicusmaps" and is located in 11221.